Our best-selling Kids size (45cm) balance ball for children ages 5-8 is now available in a Junior size (52cm) for ages 8-12 or anyone who may need a little extra height. Also, features five built-in soft stabilizing legs so it stays in place and won't roll away when not in use. 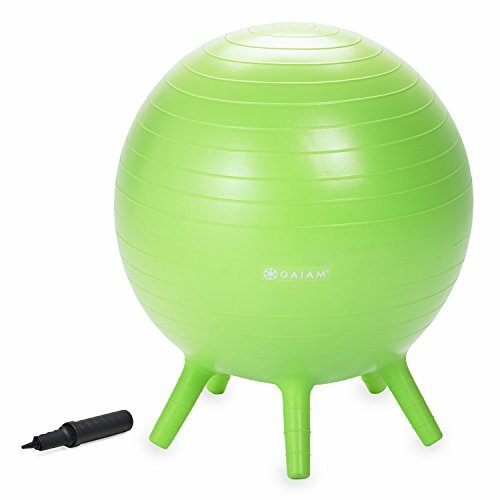 This stability ball chair is the perfect alternative classroom seating solution that encourages kids to learn and practice healthy posture while teaching concentration, balance and calm - even in the face of too much silliness. The constant ball movements keep the body active and the mind engaged simultaneously and work to increase blood flow to the brain, leading to better focus and concentration all the while helping to shake out the wiggles and work out those funny bones and reduce distractions and boredom in class. Gaiam is a leading lifestyle brand with a mission to make yoga, fitness, and well-being accessible to all. Gaiam was created as a lifestyle company with the vision that, given a choice, people would choose a lifestyle that is healthy and life enhancing, for themselves, their families and the Earth. The Gaiam wellness, yoga, meditation, and recovery lifestyle is a vote for individual health as well as the future sustainability of the Earth's resources. Gaiam strives to provide customers with alternatives to traditional products by offering natural or healthy versions that compare with the style, quality and price of conventional products. RECOMMENDED HEIGHTS: Kids (45cm) = Ages 5 - 8 or ranging in heights from 45" - 50" / Junior (52cm) = Ages 8 - 12 or ranging in heights from 51" - 56"